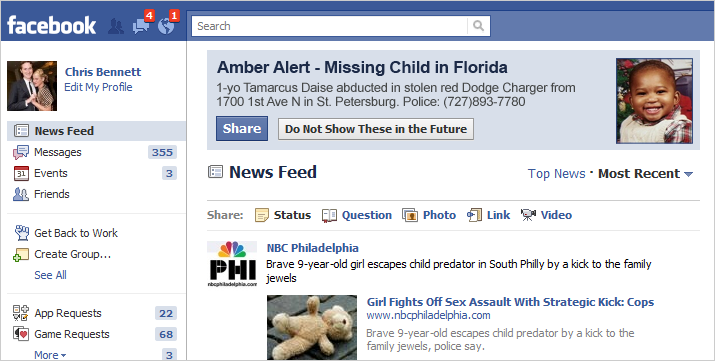 The timelines of Facebook users will now have Amber alerts, which will help find missing children in areas near them. In coalition with the National Center for Missing and Exploited Children, Facebook will start sending alerts to the mobile phones of users if they are in an area where a child has gone missing. Many people are already using Facebook as a tool to find lost children in family and friend circles. It is also widely being used to find lost pets by pet parents by sharing information and photographs on the wide social network. In March last year, a 11-year-old girl who had gone missing was found in a South Carolina motel room when a motel clerk called police after seeing an Amber Alert on Facebook. Amber Alerts provide information about missing children. The alerts also include photographs to find resemblance. Google and Bing have also recently added Amber alerts. Facebook will uniquely provide sharing options, which will reach a greater number of people. It will also have a live link, which will provide up-to-the-minute information about the case.